Microsoft just announced a Halo "digital feature project". Ridley Scott and David Zucker (Naked Gun, Scary Movie) are involved as executive producers, while Sergio Mimica-Gezzan (who has directed some episodes of Heroes and Battlestar) will direct. This isn't a BIG movie, in the sense that this won't go to theatres in the summer and cost hundreds of millions like the ol' Peter Jackson and Neil Blomkamp projects. Instead, think something smaller in scale, like the not-terrible Forward Unto Dawn series. 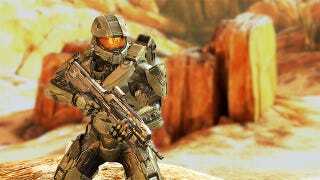 It'll be out "later this year", and won't be starring Master Chief. if you're wondering, this isn't related to the Halo TV series.